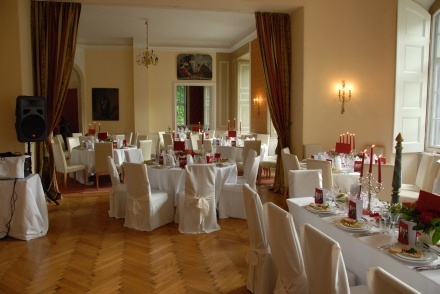 The castle with its manifold architectural features offers spacious rooms for different social occasions, e.g. to celebrate family events like a birthday, a wedding, baptism or confirmation. It is also suitable for expositions, business meetings, seminars, wine tasting sessions or other gatherings (including the grounds). According to the special occasion and/or the size of the group you may choose the room that suits your needs. Shortly we will also be able to offer civil wedding services. Overnight accomodation (basic amenities) can be arranged. Additionally, catering services (including china, glassware, cutlery) can be provided. Le gran salon entèrement parqueté et éclairé par de hautes fenêtres, donne sur le parc. Il servait autrefois de salle de bal. Grâce à ses vastes dimensions (plus de 160 m²) il peut acculeilir jusq’à 150 personnes et être aménagé librement pour toutes sortes de manifestations et cérémonies. Ce salon donne par une terrasse sur le parc où l’on descend par un bel escalier en pierre à deux volées. The (former) Kitchen (70 square metres) is also available. 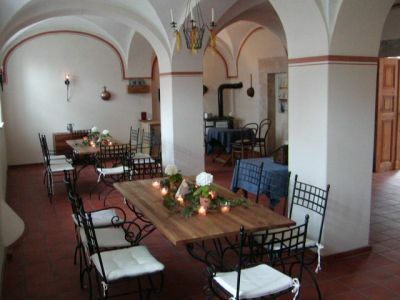 With its crossvaulted ceiling it is the appropriate setting for country-style events. The Hunters' Room is very suitable for smaller groups because of its intimate atmosphere. 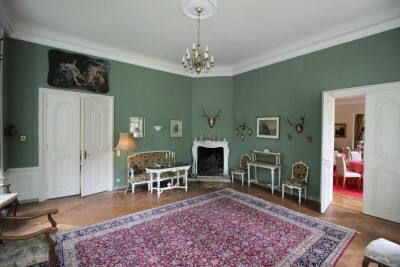 It has parquet flooring and an open fire-place. The Ancestral Hall is perfect for small receptions and celebrations. 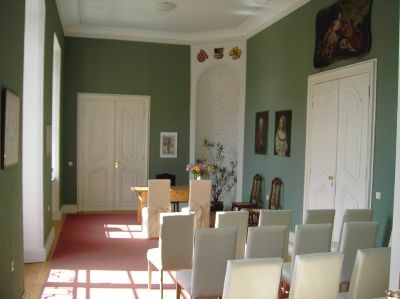 We offer civil wedding services in this room. 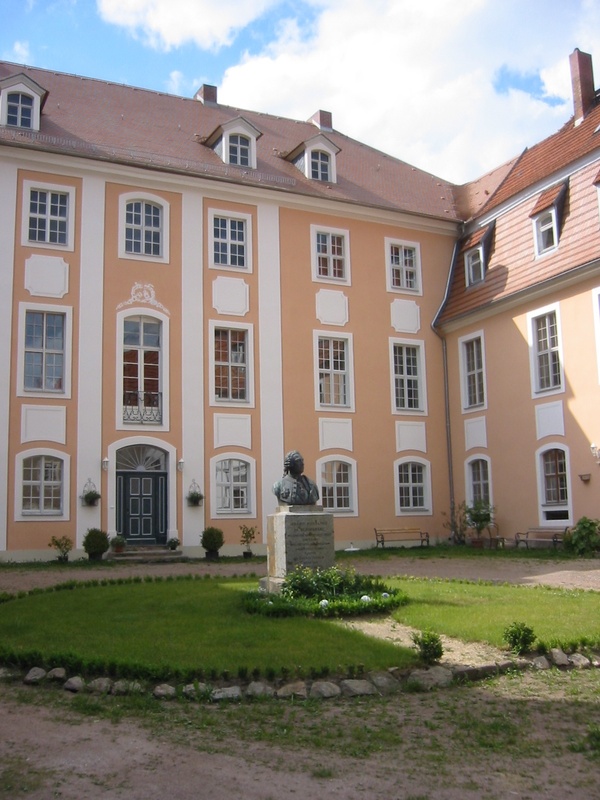 Reichstaedt Castle is situated in the center of Reichstaedt, a suburb of the city of Dippoldiswalde. Reichstädt is located 21 km south of Dresden and about 3 km from Dippoldiswalde.